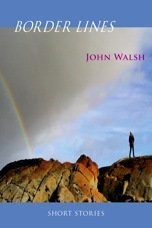 Perhaps better known as a poet, having published three collections of poetry in the last few years, and as MC of the monthly North Beach Poetry Nights in the Crane Bar, Galway, John Walsh is also a writer of short stories, and Border Lines, recently published by Doire Press, presents an excellent sampling of what he is capable of. Many of the stories included revolve around the same character, Ian, as he negotiates life’s variegated twists and turns, many of which he blunders into with a mixture of innocence and a self-destructive impulse. In ‘Jimi’, a teenaged Ian skives off to a Jimi Hendrix concert and reaps the reward from a violent father on his return. A college-going Ian crosses paths with the slightly older trumpet-playing Raymond in ‘Trumpet in the Towel’ and gains a glimpse of the glamour and possibilities of a life outside Ireland as the trumpeter leaves these shores to forge his in London. ‘Such a Good Invention’ sees Ian transplanted to London, falling for artist Deborah, and grasping at a kind of happiness he can’t quite articulate and which proves illusive. In the stories that feature Ian, what we get is a mosaic of a life that builds over the course of the collection, and not necessarily in chronological order, to form a fractured and imperfect picture of a man searching for some meaning in a world that seems, on the surface of things, to be devoid of it. In ‘Winter Sun’, Ian and his wife, Sandra, enjoy a holiday in the sun, and we detect, through a waiter’s story of heartbreak and the neon nightmare of a nearby resort, the first hint of stormy times ahead for the couple. ‘Yesterday’s News’ sees Ian floundering in the last vestiges of a sinking relationship with Ellen, pre, post or during his marriage to Sandra, we’re never quite sure. Till, in many ways a young version of Ian, stumbles along a dark country road in ‘New Year’s Day’ (which was shortlisted for the 2011 Over the Edge New Writer of the Year award) and encounters a drink-driving, older and no wiser, Ian, who offers him a place for the remaining hours of the night. A sense of history repeating itself, of unbreakable patterns, pervades the piece. Highlights of the collection include ‘A Different Story’, which details a truly unsavoury act of manipulation by a controlling and abusive driver on a desperate hitchhiker, ‘A Beautiful Day’, about the simple joys of a day spent fishing in a local river, ‘You’re Never Alone’, where an Irish man working in Germany is drawn against his better judgement into the empty pleasures of a brothel while his wife is away in Prague, and ‘The Way Things Happen’, an (autobiographical?) account of a writer meeting what could turn out to be the love of his life and how it could all have gone wrong. Border Lines is topped and tailed by a story of Ian as a young boy and his favourite uncle, Roy, who leaves Ireland abruptly on the flimsiest of excuses and a story where Ian and his uncle encounter each other again more than thirty years later. This final story, ‘My Perfect Uncle’, connecting as it does with the opening piece, serves to unite the whole book as a story arc and ends the collection on a satisfyingly uplifting note. The reader suspects Ian has arrived at a point in his life where some things at least make a kind of sense to him and don’t necessarily have to be picked over and examined too closely.